No single person can take credit for Singapore’s success in the teaching of mathematics, but if I could nominate someone, it would be Berinderjeet Kaur, Professor of Mathematics and Mathematics Education at Singapore’s National Institute of Education. Along with others, I was lucky enough to hear her speak recently about Singapore’s mastery teaching approaches. I heard her talk about foundations, walls and roofs in mathematics. It was enlightening. I used a similar analogy in my last post – if the foundations in mathematics aren’t firm, there’s not much chance that the walls will be, and they’ll certainly not hold the roof up. Professor Kaur sees Singapore’s framework for mathematics education – its famous pentagon –as something that is built from the bottom up. For anyone less familiar with the pentagon, at its centre is ‘problem-solving’, surrounded by five inter-related components: concepts, skills, processes, attitudes and metacognition. Concepts form the base, supporting skills and processes. Only once these are firmly laid can the ‘roof’ of metacognition and (positive) attitudes towards mathematics be added. This enables prized mathematical problem-solving (if you don’t mind me stretching the analogy somewhat) to move in. It means that even Singapore accepts that problem-solving is a non-trivial aspect of mathematics and not something that pupils can dive into without the right foundations. Indeed, it is something that needs to be built towards and built on over time. We also learned more about maths teaching recently from UK researchers. In November the Education Endowment Foundation (EEF) published its research-based guidance on the teaching of mathematics at Key Stage 2 and 3. This too has something to say about problem-solving. It points out that genuine problem-solving tasks are those for which pupils don’t have well-rehearsed, ready-made methods. They require mathematical reasoning. Key Stage 2 reasoning papers contain just such problems. A good example shows a circle with 1/4 and 1/6 shaded. The question asks ‘What fraction of the whole is not shaded? Show your workings’. I’ll leave you to reason. I was interested in a small but crucial comment in the EEF guidance – that the evidence base on problem-solving in mathematics is ‘mixed’. 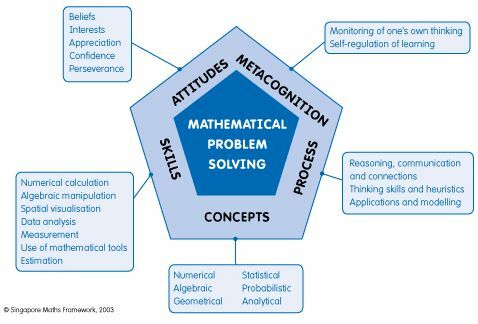 That’s EEF language for saying that, based on analysing many rigorous studies and meta-studies, the teaching of problem-solving in mathematics may lead to better mathematics outcomes, but it may not. In other words, teaching problem-solving in the mathematics classroom is a risky business. I’ve visited mathematics classrooms where pupils are busy discussing problems in groups and where teachers proudly declare that ‘we’re doing problem-solving’. This may be great but feels risky and may leave some pupils none the wiser. The EEF review found that the specific approach matters, for example: leading pupils closely through worked examples, analysing and discussing these (rather than leaving pupils to it), presenting problems that are similar but slightly more challenging than previously-solved ones, and walking through examples with common errors and misconceptions for pupils to uncover. In other words, problem-solving requires good scaffolding. Let’s not lose sight of the point of adopting teaching approaches from the Far East, which is to foster both high achievement and high equity. Without good scaffolding some pupils, particularly those from disadvantaged backgrounds, could be left behind. Teaching methods and problems to solve need to be selected carefully to reduce this risk. Again, mastery isn’t mastery without a good set of well-tested and proven resources. I too too am a big fan of the iconic Singaporean Pentagon image and the underpinning pedagogical frameworks and have often wished the DfE had adopted and used this ‘message’. Thanks, Mike, for taking the time to respond. It’s interesting to hear your perspective on this. We both share the view that mathematical problem solving is something that pupils and students find challenging and needs modelling by teachers in the right way when pupils are ready.